It’s getting closer to midnight and the horrific possibility of nuclear war. 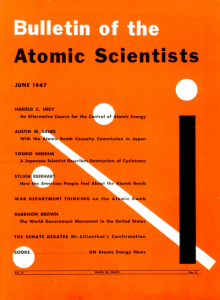 The Bulletin of the Atomic Scientists just moved the Doomsday Clock forward two minutes to the dreaded witching hour. The Doomsday Clock first appeared on the cover of the Bulletin of the Atomic Scientists magazine in 1947. It was a warning to the public that nuclear catastrophe could be near. 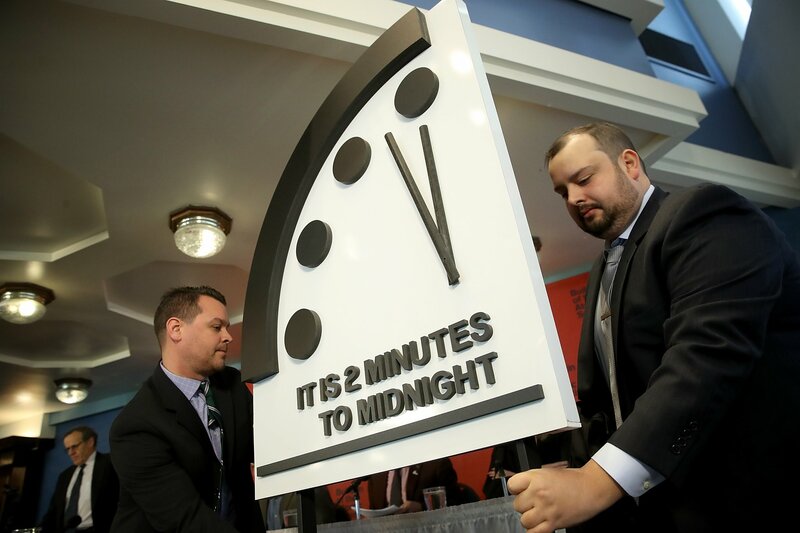 The clock is meant to spur action to control the threat of nuclear weapons. President Trump, on the other hand, has made little effort toward nuclear diplomacy. This is tragic because U.S. leadership is desperately needed. Instead of sending out mindless threats to the Soviets, Eisenhower tried to achieve a treaty with them on ending nuclear weapons testing. This effort which led to a suspension of nuclear tests on both sides during the last 3 years of his presidency. It also paved the way for the Limited Nuclear Test Ban Treaty signed by President John F. Kennedy in 1963, which reduced tensions in the wake of the Cuban Missile Crisis. The Limited Test Ban Treaty set the Doomsday Clock back to 12 minutes to midnight, but the hope was that a more comprehensive treaty would follow. But to this day we have still not achieved a complete ban on nuclear testing. We should get this treaty now as step toward defusing tensions with North Korea. The United States should lead in getting the Comprehensive Nuclear Test Ban Treaty (CTBT) to take effect worldwide. This treaty bans all nuclear test explosions. There are currently eight holdout nations: The United States, China, North Korea, Iran, Egypt, Israel, India and Pakistan. If the United States, North Korea and China (the North’s ally) ratified the CTBT together this would stop nuclear tests and build cooperation toward disarmament. The three nations could participate in on-site inspection exercises for the CTBT, which would enhance confidence for more agreements. We don’t want to see any nation test nuclear weapons and cause such international tension. The North Korean nuclear crisis shows the urgency of the Comprehensive Nuclear Test Ban Treaty. There is even a large CTBT Youth Group of students from around the globe that is advocating for the treaty’s passage. President Trump should announce plans to ratify the CTBT during his State of the Union address. 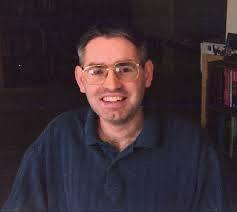 A world free of nuclear testing would create the conditions for a world free of nuclear weapons. George Schultz, who was the Secretary of State for President Reagan, says, “The CTBT would make us and the world safer, but it would also be part of rebuilding the momentum toward realizing how dangerous nuclear weapons are and getting rid of them.” It is very much in our interest to have a world free of nuclear weapons especially when terrorist theft and accidental launch are very real. In fact, these were two of the primary reasons cited by General Andrew Goodpaster and General Lee Butler in 1996 when they put forward a long-term plan for nuclear arms elimination. Those dangers are even more prominent today. The recent false alarm of a missile headed toward Hawaii is a terrifying reminder of the only thing that can destroy the United States: nuclear weapons. Such accidents and false alarms could lead to a nuclear war. As Hawaii Congresswoman Tulsi Gabbard said, “What makes me particularly angry is that the people of Hawaii and this country live with the fear of a missile attack at all.” Gabbard says we need to negotiate with North Korea to end the risk of nuclear attack. She is right. Nations also suffer from nuclear weapons spending and the diversion of valuable resources, with North Korea being the worst example. Around 70 percent of its population lives in hunger according to the World Food Program. Diplomacy is our best hope for resolving the North Korea nuclear crisis. It is our best hope for achieving the elimination of nuclear weapons worldwide. It will not be easy. But as President Kennedy said “Let us never negotiate out of fear. But let us never fear to negotiate.” We must find a way out of this nuclear weapons nightmare. The fate of the world depends on it. The clock is drifting closer to the midnight hour.